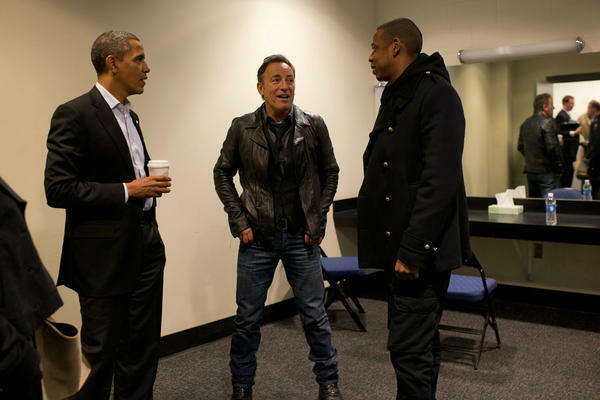 On the final day before the 2012 presidential election, Bruce Springsteen appeared along with Jay-Z in support of President Obama at the Nationwide Arena in Columbus, Ohio. This was Bruce's second of three campaign appearances in support of Obama on this Monday, and his sixth overall. It also marked a return for Bruce to Ohio, where he made his first 2012 campaign appearance in support of Obama on October 18th. Thousands filed in early, enthusiastically cheering a variety of songs on the P.A. including Bruce's "We Take Care of Our Own" (a song that has taken on dramatic new meaning in the days since Hurricane Sandy). When Al Green's "Let's Stay Together" came on, the lower bowl became a dance party. Due to substantial security measures outside the arena, including closure of major roads and garages closest to the venue as well as security checks on the way inside, the arena was slow to fill. I made it in just minutes before the scheduled start time, and arriving right alongside me was Pastor Donetta Peaks of Centenary United Methodist Church; she was due to give the opening invocation. There were still long lines outside when the Columbus mayor Michael Coleman took the stage to announce, "Victory is at hand!" Eventually, 15,500 people would make it inside for the main speakers and performers. Pastor Peaks got to her invocation in good form, blessing Governor Romney as well as the President. After Ohio Governor Strickland and Senator Sherrod Brown spoke in support of Obama's re-election effort (with Governor Strickland predicting that Fox News would make the call at 11:37pm tomorrow evening, much to the amusement of the Fox delegation at their press table), it was time for Bruce to perform. While the speakers were all in the center of the building, the music was on a side platform. Bruce took the stage without being formally introduced and proceeded to give acoustic performances of "No Surrender," "The Promised Land," and "Obama" (aka "Forward") before a short speech outlining his reasons for supporting Obama once again. The "Obama" ditty is somewhat more fleshed out than at his first Ohio performance in October, but it's probably a safe bet that it will be retired after tonight's final campaign appearance in Iowa. The humorous introduction was much more fully realized, with detailed inventions of phone calls he's been taking from Obama (which also gave Bruce a chance to reprise a bit of "Let's Stay Together" with the audience). After the speech, he closed with one more song, a dedication of "Land of Hope and Dreams" to the President. For Springsteen, the performance here was his sixth in six days, including three full band concerts, a performance in the Hurricane Sandy: Come Together telethon, and two campaign appearances with Obama. Tonight in Iowa will be number seven. And later this week he will perform in another benefit, this time for the Bob Woodruff Foundation in New York City. Maybe there have been other occasions with as many performances for as many purposes in such a short span of time, but I can't readily think of any. Springsteen isn't often slated as a warm-up act, but this afternoon was an exception. Not that there were any flaws in Bruce's performance, mind you, but Jay-Z came on after him and pretty much blew the roof off the building, working the entire stage and changing selected lyrics to fit the campaign. Bruce and Patti enjoyed the entire Jay Z set from the wings. Back in the center of the building, Jay Z introduced the president. Obama gave his speech, bringing Bruce and Jay Z back up to the stage (along with the prior speakers as well) for one last wave as "We Take Care of Our Own" played, and then they were off for Iowa. Except for Obama, who came back for an encore wave after most of the audience was gone. Did he learn that move from Bruce? Perhaps that's one that Bruce told him about, in one of their late-night phone calls.